As we mentioned in our SEC West article, coaches can be judged by many different metrics, but we at CollegeFootballWinning.com are most interested in metrics that reveal something about a team’s sports-betting status. There is a single measure that gauges a team’s (i.e. a coach’s) performance relative to public expectations; it is the margin of victory (MOV) against-the-spread (ATS). [To read all about MOV ATS and its efficacy as an assessment tool, please CLICK HERE.] As we did with the coaches of the SEC West, we applied MOV ATS to all the SEC East coaches to determine who has done the best job of beating expectations at his respective SEC school. 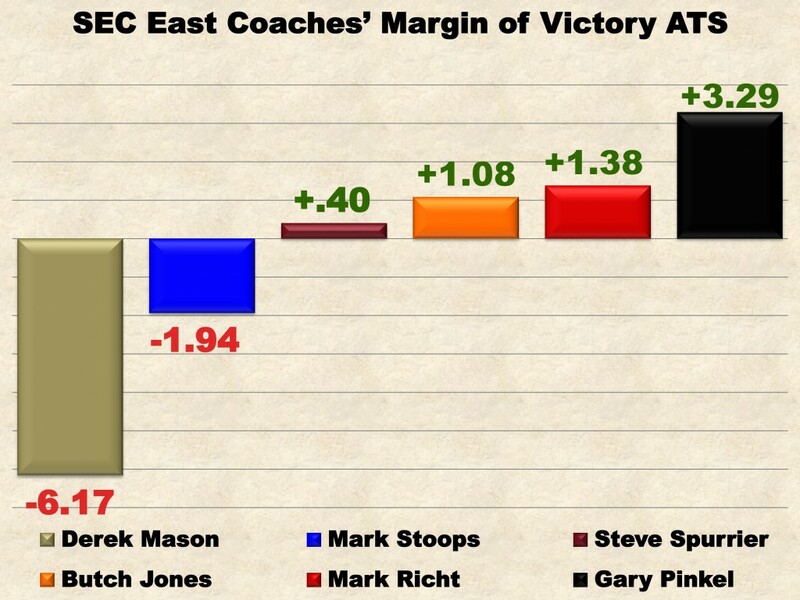 Easily, Gary Pinkel and his Missouri Tigers have outperformed all the other SEC East coaches (and their teams) by quite a bit. Derek Mason, the head coach of the Vanderbilt Commodores, has such a terrible MOV ATS- by far the worst in the SEC- that if he continues to have an MOV ATS that is -6 or worse, we can all but guarantee that Mason would be fired in or by his fourth year (using historical MOV ATS numbers and college football firings as relevant precedents). To be fair to Derek Mason, he has only coached one season in the SEC, and he was following Coach James Franklin who had an MOV ATS of +4.71 while at Vanderbilt! In other words, the traditionally low expectations for Vanderbilt football had been raised significantly by Franklin. Mason came in to those elevated expectations and failed to get anywhere near them. He may have “succeeded” in lowering the expectations for Vanderbilt and himself to such a degree that his 2015 season might reflect those diminished expectations (and give him a much better MOV ATS). Mark Richt of the Georgia Bulldogs has coached there since 2001. His greatest MOV ATS year was 2002 when he shocked the college football betting world by achieving an MOV ATS of 8.82! He followed that incredible 2002 season with a lackluster MOV ATS of +0.27 in 2003. That might be noteworthy since Richt and his Bulldogs achieved his second-highest MOV ATS season in 2014 (at +5.31). High-profile coaches with high MOV ATS seasons seldom “surprise” (positively) the next season. Using the metric, MOV ATS, as our sole assessment tool, the second-best coach in the SEC East (Mark Richt) would be the second-worst coach in the SEC West. These data on the SEC East provide quantitative corroboration for the popular sentiment that the SEC West is (currently) the much better division of the SEC.